...and the other is in his fifties! These two whales were the first of their pod to be identified by Ken Balcomb back in the late 70s when scientists realized that every Orca has a distinct pattern of markings. 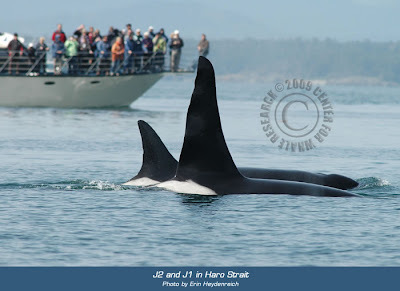 J1 is the impressive male with the characteristically tall dorsal fin, and J2 is tucked in behind him. Because of their relative ages and the fact that the pair is together so often, most likely they are mother and son. J1 is 58 years old, and his mom is almost 100. 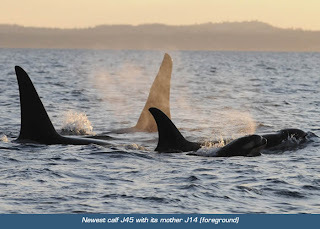 The concept that Orcas can live so long in the wild is just amazing -- we can only imagine the changes that J2 has witnessed over the course of her lifetime, and what remarkable adaptations she has had to make. This photo of Pike Place Market was taken in 1911, about the time that J2 was born -- and shows more horses and buggies than cars! Pike Place Market circa 1911 (Photo courtesy of the University of Washington). Salmon were abundant then and the water less polluted. She was born before TV and not long after the first flight by the Wright brothers. Before scuba tanks or sonar, antibiotics or bandaids, and even before sliced bread! It is remarkable that she has led her family and navigated so much change, and we can only hope that the Orcas have enough resilience to withstand the current dismal salmon situation. Our resident Orca pods were seen off California periodically this winter, which prompted me to ask Ken if he thought the whales would permanently move out of our area. He replied that they will probably stay here, but that they will have to go where they can find fish or starve. So - you might want to take advantage of this great weather we're having and take a trip up to look for our venerable matriarch, she was spotted last Wednesday right off shore at San Juan Island. There is a shuttle you can catch when you disembark from the ferry in Friday Harbor that will take you to the whale watching park, so you can leave your car at the ferry terminal in Anacortes and walk on. It is a fun and easy day trip even if the whales don't show up (but be sure to check schedules and bring munchies and sunscreen, you may wind up staying longer than you planned!). Although the Center for Whale Research is not involved with public tours you can check our links page for other recommendations. Lisa Moorby has redesigned our website, it is very user friendly and helpful, plus she has selected beautiful photos of the whales to enjoy. A century old whale is something to see, and who knows, you may even see her with the new calf, her great-grandson J45!